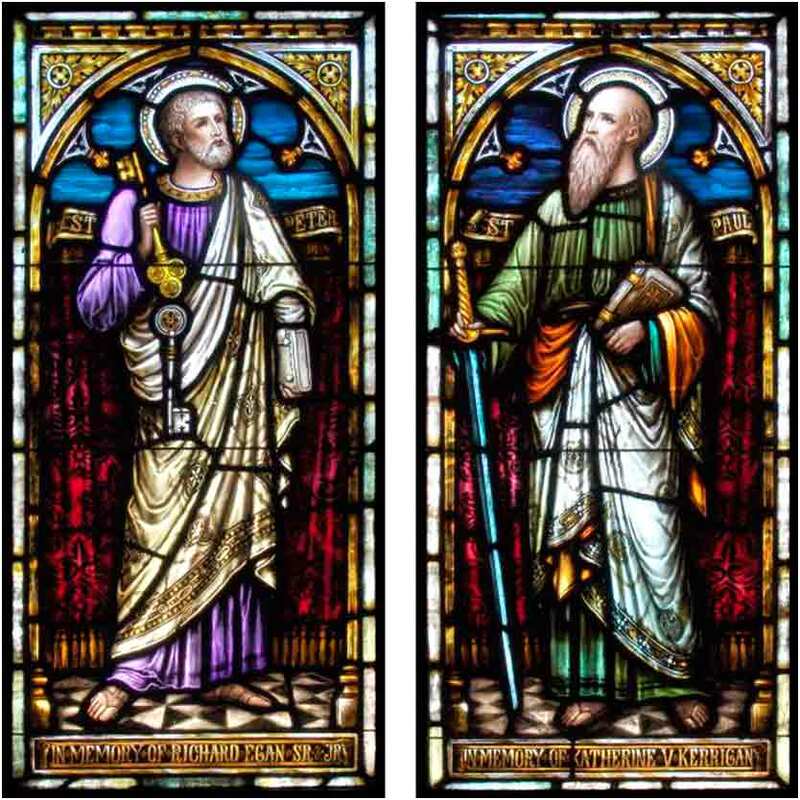 Peter and Paul, stained glass windows from St. Mary of the Assumption Church, Katonah, New York. O good shepherd, seek me out, and bring me home to your fold again. Deal favourably with me according to your good pleasure, until I may dwell in your house all the days of my life, and praise your forever and ever with them that are there. Healing Peter's Mother-in-Law, illustration ca. 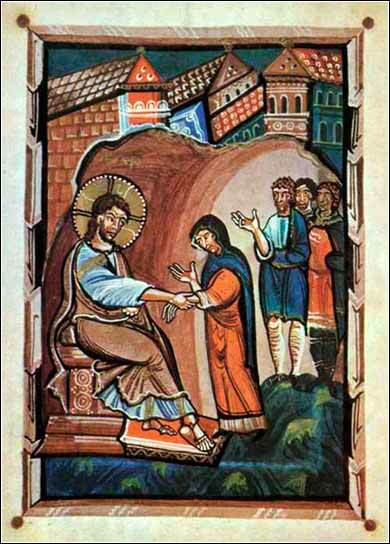 1020 A.D., from the “Abbess Hitda von Meschede” Gospels, Darmstadt, Germany. And when Jesus entered Peter's house, he saw his mother-in-law lying sick with a fever. He touched her hand, and the fever left her, and she rose and began to serve him. That evening they brought to him many who were oppressed by demons, and he cast out the spirits with a word and healed all who were sick. All three Synoptic Gospels (see also Luke 4:38-39) recount this incident. Jesus healed a lot of people in the first year of His ministry. Only a fraction are recorded specifically; as in today's Scripture, one incident is detailed, but we see that he healed “many” others. And there are just as many lessons we can take from Christ healing the sick: His love of humanity; His divine power; His role as taking upon Himself human suffering; and as a sign of His divinity. But while Mark and Luke use the specific story of Peter's mother-in-law for its powerful direct message, Matthew adds several additional dimensions to it. If we read certain translations, it might seem that Matthew is stretching the quote from Isaiah to mean something that Isaiah did not intend. The King James Version, for example, translated Isaiah 53:4, “Surely he hath borne our griefs, and carried our sorrows.” It doesn't sound like Isaiah was talking about literal diseases. But it is the King James translation, not Matthew, which drops the ball here. King James and many subsequent translations treat the implication of disease in Isaiah as a metaphor for sinfulness, but it might be read better as a prophesy that the Messiah will, literally, heal illness. The Contemporary Jewish Bible translates the passage, “it was our diseases he bore, our pains from which he suffered . . . .”, very much the way Matthew translates it. In addition to the direct importance of healing the ill (and, in Matthew, the significance healing has to the fulfillment of prophecy), there are two peripheral matters of notable importance in today's passage. Because Peter's importance to Christianity will grow steadily until his death — he and Paul are surely the two most important people in the Christian Church, after Christ Himself — this is the source of discussion, especially in the Catholic and Orthodox Churches, about the need for priests to be unmarried. Secondly, when the woman was healed, what did she do? “She served them.” She had been severely ill — likely with malaria — yet, when she is healed, she does not lie back and rest; her immediate desire is to get to work in the service of Christ and His disciples. She becomes a paradigm for Christian conversion. We are healed when we receive the Holy Spirit, healed of the sickness that brings death and given life. Peter's mother is a model for what we must do with our health; to take on the burden of Christ with the remainder of our earthly life, as servants.